Grade of F. Rough day in the Oval Office huh Chucky? Trump made you and Nancy look like the fools you are. You were both embarrassingly out maneuvered. What a pleasure to watch. Did you wet your pants? Yeah, you definitely did. Grade of F. Rough day at the Oval Office huh Chucky? President Trump made you and Nancy look like the fools you are. You both were totally out maneuvered. What a pleasure to watch. Did you wet your pants? Yeah, you did. Grade of F. Awwww. Poor Chucky. Got yourself nuked on the Gorsuch nomination. Did you wet your pants? Sure you did. Wait, you created the filibuster in 2003 to stop Bush appointees. Wait, you went nuke in 2013. So what are you whining about? You are a Fraud! The other Dems gave you cover. All New Yorkers should know that you do not stand for Israel or any of us. You take your orders from the Unions, Soros and Obama the Marxist. 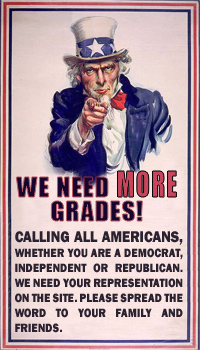 I gave you a grade of F. The constitution comes first, not your relection. I gave you a grade of F. Its time for you to retire. Obama can have you walk his dog. I gave you a grade of F. I see how you like to stand real close to Obama, its sickening.